Simple 5’ x 8’ pressure treated pine porch with a low slope or flat roof can be built for about $5,450 - $6,700, but custom stone work with incorporating numerous of decorative elements and creating a stylish design might increase the cost up to $15,800 - $25,300 or even more. Expenditures for materials alone might very as much as 250% - 800% and labor cost will depend on work complication and who will be hired to complete the project. Foundation might be very costly if building a porch on a slope. Digging holes for sonotubes along with proper mesh installation and up to local codes concrete work might be estimated at $250 - $450 per each load-bearing post. Ordering precast concrete piers might decrease on-site labor hours, but they might be extremely heavy and will require special equipment for installation. The price might increase up to 200% if the porch floor will be a solid concrete slab. Prices for one cubic yard of a concrete range from about $60 to $85 and including delivery and on-site work pouring simple 4' x 6' concrete porch with 3 - 4 steps will cost at least couple thousand dollars. Crew of two carpenters and a helper should be able to finish rough framing in about 1.5 - 2 days and labor will be estimated at approximately $830 - $940 for small to medium standard wood deck. 8 x 8 posts, 2 x 10 floor joists, 2 x 6(8) roof rafters will cost about $200 - $300 for a 10’ x 6’ deck plus another $90 - $150 for nails, screws, hangers and other essential materials. 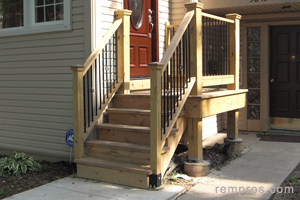 Building a porch stairs might be an additional charge and the cost will depend on stairs size and design. Using steel for a frame and welding all metal pieces will increase the labor expenses. Pressure-treated Southern Yellow Pine decking is one of the cheapest and widely used options. Roughly estimated at $1.00 per square foot 1” x 6” boards will be a good option for low budget porch. Red cedar decking will be twice more expensive. But high quality products including Trex or Verdana composite decking or exotic wood such ipe or cumaru will be estimated at much higher prices not only for materials, but for labor as well. Custom made railing work, installation of stylish columns or building a complex roof will increase the cost significantly. While a standard 8’ x 10’ wood porch might be done by three professionals in 2 – 3 days after foundation concrete is cure, complex custom work might take a few times longer to complete and result in labor expenses increase. Licensed electrician will charge $45 - $55 per hour to install porch light fixtures. Hiring a local remodeler to stain and apply finish on a wood might cost 350 - $450 for one – two days of work and for $30 - $45 per hour painter will apply anti rust protective coat of paint on the metal posts, joists or railing elements if any incorporated in the porch design. Porch size is definitely a prior factor the total construction cost will depend on. While a small front porch on a four posts with a five steps stairs might be done for as little as a few thousands, the same type and style porch on the whole house length porch will double or triple the price nearly proportionally to its size. While thinking about cutting labor expenses and build a simple porch by self do not forget about permits and inspections. Fee for permits vary, but prepare to spend an additional couple hundred for paperwork. How much did you pay for building a porch?